Last month I was in Washington, D.C., for a meeting to review and celebrate the miraculous global agreement in 1987 known as the Montreal Protocol. I say “miraculous,” because it was pushed through by a Republican administration with Democratic support — and ratified unanimously by the U.S. Senate. You may remember that this was an agreement to phase out the chlorofluorocarbons (CFCs) and other compounds containing chlorine and bromine that catalyzed the destruction of the stratospheric ozone layer that protects all of life from dangerous ultraviolet (UV) radiation. 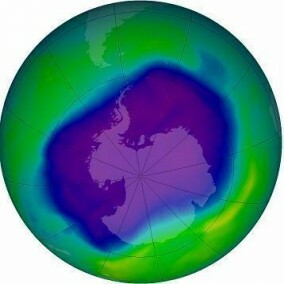 The scientists sounded the alarm, and the dramatic ozone hole over Antarctica made the threat real to the public. Despite large scientific uncertainties, a Republican administration looked at the colossal risks, overruled business interests and negotiated the most far-reaching and successful global environmental agreement of all time. Without this agreement, we would now be in the midst of a global catastrophe. Stratospheric ozone would already have fallen by 20 percent, with a corresponding dangerous increase in UV radiation — and by mid-century the global fall of stratospheric ozone would have been so large that crop yields and life over the whole planet would have been seriously damaged. Of course we humans were worried because going out in the sun without full protection would have meant rapid sunburn, as well as a huge rise in skin cancer. The Montreal Protocol allowed for sequential tightening of the reductions as the scientific evidence accumulated, and the total phase-out has been accomplished with remarkable speed and minimal cost. It will still take decades for the Antarctic ozone hole to recover, but we managed to save the rest of the planet just in time. The reduction of these ozone-depleting gases is a clear example of why we must continually seek ways to eliminate the long-lasting waste products from our industrial civilization. This particular case had a big, unexpected benefit. Because the CFCs are powerful greenhouse gases, eliminating both the CFCs and their initial replacements, the HCFCs, has slowed climate change significantly. In fact, the Montreal Protocol has reduced the greenhouse-gas warming of the Earth by five times as much as the rather unsuccessful Kyoto Protocol. This celebratory meeting had a second purpose: to contrast the success of Congress 20 years ago when it passed this global environmental agreement with its complete failure now to address the equally large threat to the Earth’s climate from carbon dioxide, the greenhouse gas resulting from the burning of fossil fuels. Rather than phase in adaptive regulations to transform our energy economy and reduce emissions, the political response has been to deny the scientific evidence. Once again we face another catastrophe of our own making. The public reacted strongly to the threat of ozone loss, because it grasped the imminent danger of skin cancer. What will be the similar wake-up call for climate change? Perhaps the increase in extreme weather around the globe — especially the more frequent floods and droughts that we are already experiencing — will convince enough people that the climate is changing now. Over the past 20 years, the political system seems to have lost touch with the real world. During the worst drought on record, we see the tragic silliness of a presidential candidate praying for rain in Texas while campaigning for policies that are guaranteed to increase drought in the southern United States. If we want our prayers to be answered, we must work with the Earth rather than against her.